In 2012 Estonian film celebrated its 100th anniversary. Photographer Johannes Pääsuke, who wandered across Estonia taking pictures of farm workers, purchased a film camera in 1912 and used it to record Utoshkin, a stunt pilot who was performing over Tartu in the province of Livonia. 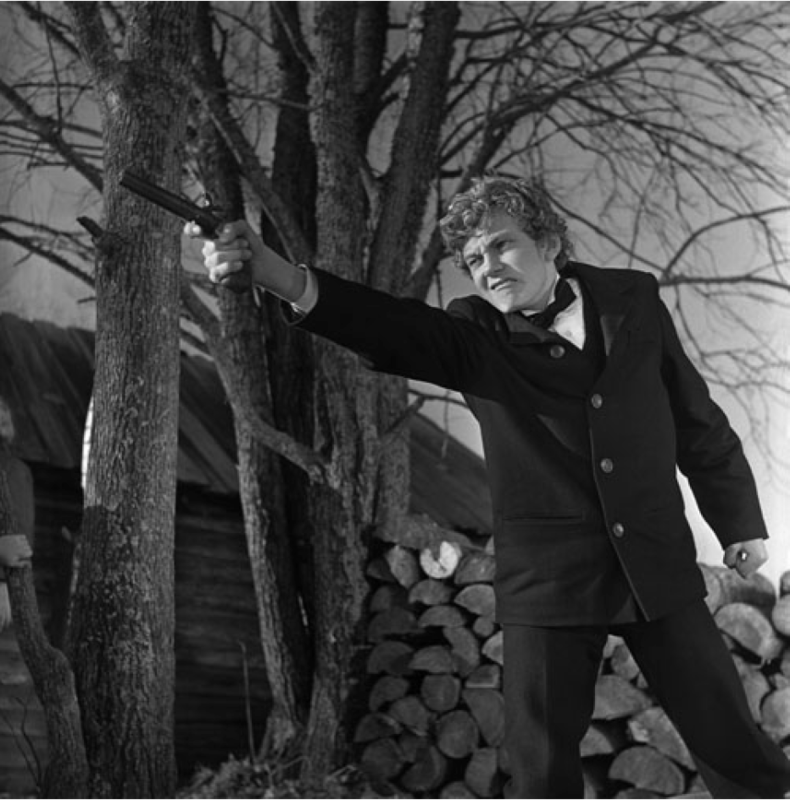 Soon after, in spring of that same year, Pääsuke completed the short political satire film "Bear Hunt in Pärnu County" ("Karujaht Pärnumaal"). It allegorically addressed the election battle between Estonians and Baltic Germans in the city of Pärnu. And with that, the first Estonian film was born. A still from the film "Bear Hunt in Pärnu County"
Estonia was a developed province of Czarist Russia and new inventions arrived there quickly. The first cinema screening took place in Tallinn in 1896 with T.A. Edison's Kinetograph. The apparatus of the Lumiére brothers arrived the following year. As in the rest of Europe, cinemas became the favourite leisure-time spot for those who had come from the countryside to live in the city slums. Where else could poor people see far-off places and exotic animals? Large cinemas even had their own orchestra, buffet, and enclosed terrace. When Estonia won its independence in 1918, small new studios endeavoured to make adventure stories and comedies. 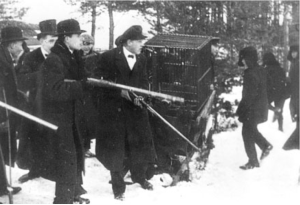 Local rogues were adapted to suit adventure films, the breeches of the marquees were traded in for local doublets, and the first full-length Estonian film was born: "Shadows of the Past" ("Mineviku varjud", 1924), which recounted the age-old Estonian fight for independence. In the 1930s Estonia imported the practices of Germany's film scene, which means documentary films were made that showed the circumstances of life and the culture of the country in a happy, positive light. The Estonian Cultural Film studio (Eesti Kultuurfilm) promoted all things Estonian as national treasures. After a few attempts, fictional films stopped being made due to economic considerations (small market). Motion pictures from the United States and Germany dominated the cinemas, though cinemas were also required to show Estonian newsreels. Films underwent censorship prior to screening, which was not done for other art forms. The first "talkie", which was shown in Estonia in 1929, was the American film that had premiered in the USA the year prior, "The Singing Fool". After Estonia was incorporated into the Soviet Union in 1940, film production and distribution were centralised and cinemas were flooded with Russian propaganda films. After the war all film production was concentrated in Tallinn's film studio, which since 1963 has been named Tallinnfilm. In 1954 the studio began to independently create fictional films and in 1957 puppet films. Naturally the script and later the film itself had to be approved by the Cinema Committee in Moscow. Only the cinema newsreels were entrusted to the local authorities. They were required to adhere to the same standards as journalism. 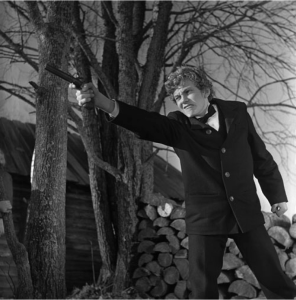 A still from the film "Spring"
Paradoxically one can only begin to speak about the massive artistic value of Estonian film starting in the 1960's, when the filmeducated staff that filled the Tallinnfilm studio surpassed the limits of the critical masses both aesthetically and in numbers. Cineasts created their own autonomous worlds, even though it was a national art form that was funded by the state and inspected by the censors. Film people created their own images, ankles fettered by the chains of propaganda. In the 100 years of its existence, Estonian film has only been a wonderland of creative people who are independent of the state during its first and last twenty years. It's true that over the past two decades filmmakers have still relied on the state for funding, but the state no longer sets out any ideological requirements. In the year 1970 the statistical Estonian visited the cinema 23 times; in 1980 it was 10 times and in 2000 only 1.1 times. In the year 2010 the number was 1.6 times. Actual films, along with their brief descriptions, are best viewed within the context of two summarising lists. The first is the list of the TOP 10 Estonian films of all time compiled in 2002. This is a numerical ranking made by the members of the Association of Estonian Film Journalists that includes Estonian fictional films from the year 1912 up until 2002. The above list does not include popular films like the comedy that rose to cult-film status "Men Don't Cry" ("Mehed ei nuta", 1968), directed by Sulev Nõmmik, or the youthful romance set during the Estonian War of Independence "Names in Marble" ("Nimed marmortahvlil", 2002, directed by Elmo Nüganen). In the summer of 2011 the most-read Estonian newspaper "Postimees" asked twenty film people to name the best films of the post-independence period (1991-2011), regardless of the genre. 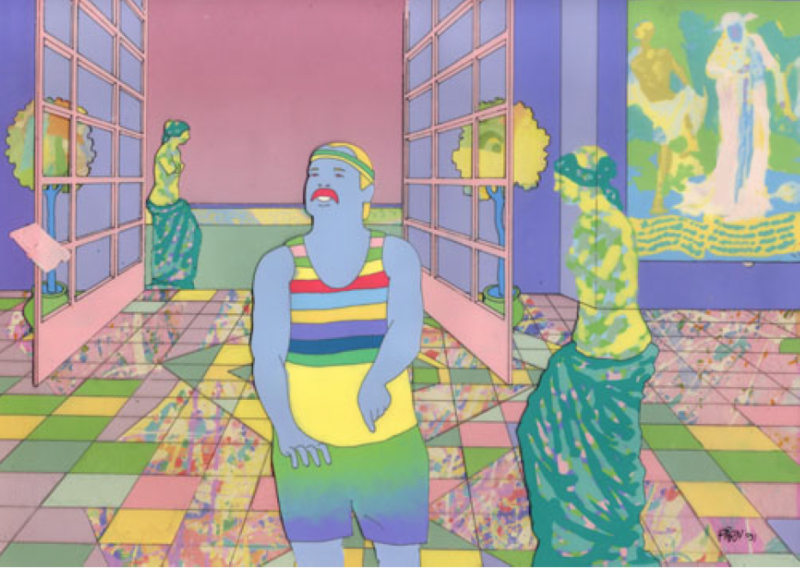 This list contains both animated and documentary films, two genres that are done very well in Estonia. A still from the film "Autumn Ball"
which path is the dead end? Estonian films rarely earn the Grand Prix at the world’s greatest film festivals, but they have won awards and, more importantly, each year new Estonian films are seen at many film festivals around the globe. Casting a glance at the names, the directors that come up most frequently are Kaljo Kiis and Sulev Keedus. Keedus has also successfully taken up documentary filmmaking. The tradition of documentary films in Estonia has been maintained, but its distribution has moved over to television. Estonian animated films, both traditionally drawn and puppet films, have since the Soviet Union era been made to a very high standard. One can say without exaggeration that Estonian animated films are guests at the biggest annual animation festivals in the world. The most well-known Estonian filmmaker is artist and director of animated films Priit Pärn. In 2011 at the 50th birthday of the International Animated Film Association (ASIFA), the most notable animated films of the past 50 years were chosen out of 852 films that were screened world-wide. Priit Pärn’s animated film “Breakfast on the Grass” (“Eine murul”, 1987) came in 11th place and his “Hotel E” (“Hotell E”, 1992) was in 36th place. A still from the animation "Hotel E"
The date 30 April 1912 can be considered the birthday of Estonian film. That was the day that cinematographic pioneer Johannes Pääsuke (1892-1918), who was killed during the First World War, pointed his newly purchased camera towards the sky and focused the lens on the flying machine, the curious new guest of the age, doing aerobatics over the city of Tartu.